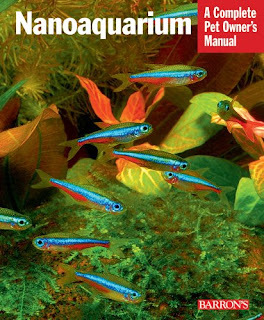 Many fishkeepers sometimes get a little embarrassed when they admit that their first fish breeding was a livebearer, feeling that they, as fish keepers, didn't have very much to do with the event. Whilst this may be true to a certain extent, it nevertheless does mean that the fish had been kept in correct conditions and were sufficiently healthy to want to reproduce and this must be a reflection of their owner's skill in maintaining the aquarium over a period of time. However, with an egg-laying species, the aquarist can have a great deal of control over what fish he wants to breed and, just as importantly, when. It should be said here, that fish will breed whenever they choose inasmuch that should a ripe male and female encounter each other then they will probably spawn spontaneously in the aquarium anyway. Without the care and attention of the fishkeeper, the eggs from egg-scattering species especially will more likely than not be eaten by the other fish in the tank and no fry will be seen. The fry from egg-depositing fish stands a better chance as first of all their parents will prepare and defend a spawning site prior to spawning and also guard any subsequent fry afterward. Let's suppose you want to try your hand at breeding something deliberately and have taken the advice of many experienced fishkeepers by choosing that popular Cyprinid, the Zebra Danio. First of all, we must ensure that the fish are 'in the mood' to breed rather than just put a male and female together and hope for the best. 'Absence makes the heart grow fonder' is one way of putting it but, realistically, separating the would-be parents is based on a practical rather than emotional supposition. It is possible that should you simply select a male and female and put them together to spawn then one of them might just have spawned without your knowledge; in which case, the attempt to spawn them would be fruitless. By separating the sexes prior to spawning, you can ensure that they are in the best condition; feeding them copious amounts of quality food (including live food) will make the females fill with eggs. This conditioning process can take a couple of weeks or so. The best way to do it might be to put the female into the breeding tank first before introducing the well-fed male later. Sexing the fish is fairly straightforward: the male fish is more slender than the female and if you look at a female, even when she is not full of eggs, there is a definite kink in the horizontal stripes along the body just to the rear of the dorsal fin. Like all Cyprinids, the Zebra Danio is no respecter of new-laid eggs, including its own. There are several ways to prevent egg eating. Any method that separates the adult fish from reaching their newly-laid eggs is acceptable. One popular method is to cover the bottom of the aquarium with a layer or two of glass marbles (the eggs fall between the marbles beyond the reach of the adults). Alternatively, you can use a bunch or two of dense plants in the spawning area: as the male chases the female into the plants, she releases the eggs which after fertilization fall into the dense plants away from the attention of the adults. There is no reason why you cannot 'flock spawn' fish. 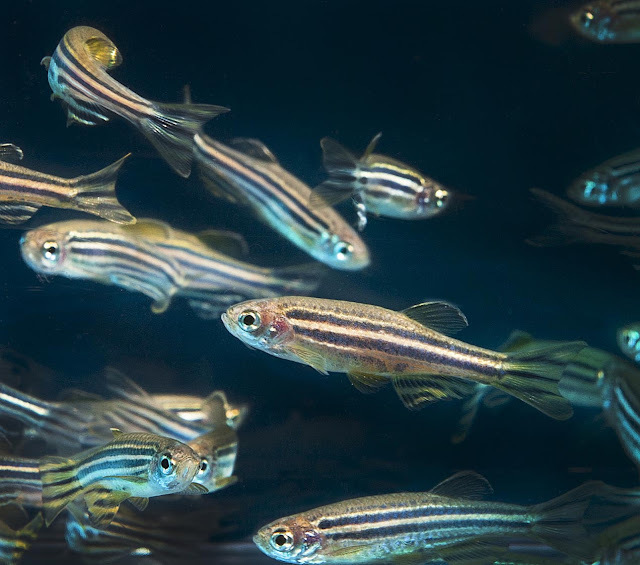 If you have several Zebra Danios then separating all the females from all the males during the conditioning period should give you more Zebra Danio fry than you'd believe possible upon the adults' reunion! But there's still the problem of egg protection. The answer is to drape a piece of fine netting across the entire water surface area of the spawning tank so that it hangs a few centimeters below the surface; weight the corners down with small pebbles. Now all that is needed is to introduce all the preconditioned fish (both sexes) into the water above the net. When the males chase the females, any eggs that are released and fertilized then fall through the net into the tank beneath before the adults have time to realize what's going on. The eggs are safe! In order to return the adult fish to their previous aquarium all you do is lift out the net (take the pebbles out first!). The fish are caught all at once with no stress at all. Meanwhile, the fertilized eggs are quietly hatching and in a few days, you will see what looks like tiny splinters of glass hanging on the sides of the aquarium. These are your new Zebra Danios. Because they are not exactly sizeable fry, they will require quite small particle-sized food at first. There are preparations of liquid fry food available at your aquatic store and it's a simple task to add a few drops of this at the recommended times to their tank. It may help if you keep a low-level light burning over their tank so that they can feed 24 hours a day. It is important during these first few days not to over-feed - a difficult task, as you'll never be exactly sure how many baby mouths you've got to feed. Therefore, regular partial water changes are of the highest importance, if water conditions in the nursery tank are not to be compromised. As the fry grow, then the feeding routine can mirror that outlined earlier for livebearers, with a gradual progression on to larger particle foods. Again, spacing out of fry into larger tanks may be necessary. The Zebra Danio or Zebra Fish, Brachydanio rerio or Danio rerio is a very popular aquarium fish which comes from Eastern India and Bangladesh. This fish is often regarded as a cool water fish, but in fact, can survive in water of a very wide range of temperatures. I have heard reports of them surviving through the winter with pond temperatures as low as 4C (3S F). This is the temperature water gets under ice. However, I do not recommend them as a pond fish for these conditions. At the other extreme, I have read that they can survive very high temperatures. Again, I would not suggest very high temperatures for it. In practice, the Zebra Danio is happy in either cold water or tropical aquariums. The Leopard Danio is sometimes given the scientific name Brachydanio frankei or Danio frankei but is probably not a true species, but rather a variation of the Zebra Danio. It crosses readily with the Zebra Danio producing fertile young. Care of these two fish is identical. The striped coloration appears to act as a dominant single gene to the spotted pattern of the Leopard fish. Note that hybrids can occur within the genus, but they are normally sterile. The Zebra Fish grows to about 2 inches (5cm) long so it is a small fish. It is usually peaceful, but I have observed enough aggression to class it as slightly aggressive, rather than peaceful. It is a strongly schooling fish and, as with most schooling fish, they tend to be more likely to be aggressive if there is less than a school. However, I have known a school of Zebra Fish attacks a Siamese Fighting Fish so I would avoid slow moving fish with long fins in with Zebra Fish. Suitable companions for the Zebra Fish include White Cloud Mountain Minnows, most tetras, including Neon Tetras, Cardinal Tetras, Glass Bloodfin Tetras, Emperor Tetras, Black Widow Tetras, small Goldfish and other similar sized fish. I would avoid slow moving, long finned fish like Guppies, Endlers Guppies and Siamese Fighting Fish. The Zebra Fish is reasonably flexible in its water preferences, but I suggest neutral to slightly alkaline water. The hardness does not seem to be critical. They do not like ammonia or nitrites, so the water should be kept clean and well filtered. If you can catch your fish before they are disturbed, the Zebra Fish is very easy to catch. They will swim into the net. However, once they are disturbed they are extremely good at evading capture. The horizontal stripes combined with its speed of swimming make seeing it more difficult. Occasionally an aquarium shop will have a competition to guess the number of fish in an aquarium on display. The fish chosen is usually the Zebra Fish because they are very difficult to count. The Zebra Fish is easily conditioned because they eat so readily. Live daphnia or mosquito larvae (wrigglers) are good. If these are not available, there are plenty of good dry and frozen foods. I use frozen blood worms. It is an easily bred egg scatterer. They are also avid egg eaters. One common way of protecting the eggs is to have the water shallow with marbles or small rounded pebbles on the bottom. Most of the eggs will fall between the stones or marbles and have a chance of hatching. Increasing the temperature a few degrees will often stimulate spawning. A temperature of about 26 C (78 F) is suitable for spawning the Zebra Fish. Eggs can hatch in a day. One female will produce between 200 and 800 eggs, so the eggs and the fry that hatch from them are small. The natural food of the fry is protozoans (Infusoria) in the water. This can be supplemented with commercial fry food. Live food is very good including screened daphnia or newly hatched brine shrimp.